One of the greatest tragedies of Korea is the separation of families in North and South Korea. The Korean War that took place about 60 years ago ripped the country in two. As a result, many Korean families were separated against their will. Today, thousand of South Korean still have family members in the North.Fortunately, there have been political efforts made to help these families reunite. There have been brief reunions for some lucky families ever since 2000 as a result of the first Inter-Korean Summit. Letters have also been exchanged. Butthose reunions and communications have been sporadic at best. The scale of these events is way too small as well. What's worse, with that generation aging rapidly, time is running out for them. I pray that one day these separated families will truly be reunited once again. # When something rips or when you rip it, you tear it forcefully with your hands or with a tool such as a knife. # Sporadic occurrences of something happen at irregular intervals. # A summit i a meeting at which the leaders of two or more countries discuss important matters. # You use at best to indicate that even if you describe something as favourably as possible or if it performs as well as it possibly can, it is still not very good. 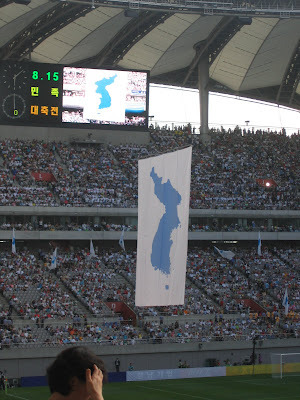 ## I wish Koreans want to see our country reunited. Some people worry about that our ecomony will depress a lot after we would be reunited between Koreas. So young generations don't want to be reunited even though North Koreans are still our families and friends. I know we will have a tough time to overcome difficult situations if we would be reunited someday. More political efforts should be made to solve this problem. I pray that two Koreas will peacefully be reunited as soon as possible in the near future.